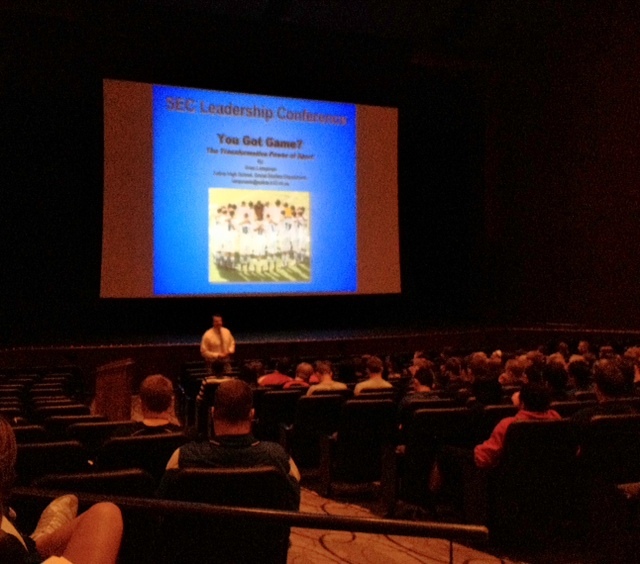 I had the opportunity to stop by the SEC Leadership Conference on Friday at Saline High School. All of the SEC schools – Bedford, AA Pioneer, AA Huron, AA Skyline, Monroe, Adrian, Chelsea, Tecumseh, Ypsilanti, Lincoln, Dexter, and of course, Saline – attended the event. The event was led by our own faculty member, Mr. Brian Lampman. Sport has the power to change the world, the power to inspire, the power to unite a people in a way that little else can. Sport can create hope….it is an instrument of peace. I agree Dottie. Our athletes from Adrian responded with a desire to require each team to do a community service project during their season. Another thought was to have an all-sports service project within each season. Their young minds were turning with ways they could make a difference in our community as athletes. Thanks to Rob, Brian, and Saline for hosting this on Friday. We do like Mr Lampman in the district. He does have a way with community with the students that is an art.